As yet, I am only imperfectly acquainted with this species which seems related to L. thoracites HCK. and L. mediterranea J. MÜLL. It differs from the preceding one in having a larger cephalis, which is broader and more obtuse, and by the want of byspines. Neither does there appear to be any other protruding spines than the principal ones, with perhaps a couple of branches. The thorax has no marginal byspines beneath. The pores here on the lower margin are larger and the walls thinner, so that probably the individual illustrated is not yet fully developed. Vary rare and only singly: Sea off Røst, 22/3 1899, 0-900m. Distribution: I have seen it in a deep water sample from the sea between the Færø and Shetland Isles (cfr. above, p. 128). Lithomelissa laticeps Jørgensen, 1905, Bergens Mus. Skrifter, p. 136, Pl. 16, fig. 84. Test with an elongate smooth cephalis, with rounded to flat top, with very small (2-3 µm) equal, closely spaced, regularly arranged, circular pores, with prominent apical and vertical spines; cephalis separated from a subcylindrical thorax by a distinct but non-planar collar stricture which is coincident with very thin ribs corresponding to the apical-lateral and ventral arches; the top of the thorax is consequently higher in its dorsal and ventral portions than on its right and left. Thorax smooth, without definite terminal margin, with pores similar to those of the cephalis in several specimens but in others with larger, less regular pores. Four collar pores present; the cardinal pores of type B. The vertical spine is as prominent as the apical spine, in some specimens the two not readily differentiated; both are three-bladed but conical in a few specimens and can be classified as horns in a few individuals. The apical spine extends from the apical bar which is present as a rib in the lower half to three-quarters of the dorsal cephalic face; it is generally more nearly vertical than the vertical spine. The vertical spine extends from the vertical bar and generally originates from the ventral arch, but in a few specimens its lower portion is present as a rib in the ventral face of the cephalis. The primary lateral and dorsal bars extend from the median bar, which is well within the thoracic cavity, as generally three-bladed spines piercing the thoracic wall; the primary lateral spines are nearly horizontal whereas the dorsal spine descends in the sagittal plane. 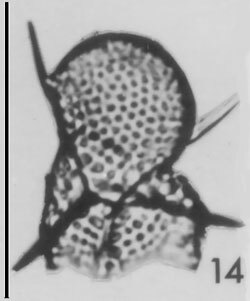 In one specimen an externa1, blade-like, solid keel is present in the sagittal plane, joining the apical and dorsal spines (Pl. 24, fig. 15). Measurements; based on 9 specimens from stations 106 and 192: height of cephalis (between median bar and top of cephalis) 37-57 µm, of thorax (from ventral stricture to mouth) 31-64 µm; breadth of cephalis 37-49 µm, of thorax 43-62 µm; length of apical spine 12-39 µm, of vertical spine 12-49 µm, of dorsal and primary lateral spines 17-42 µm. Remarks. This species is distinguished by the long vertical spine, by the generally small, closely spaced, circular pores of the cephalis, in some specimens of the thorax as well, and by the presence of the median bar well within the thoracic cavity. The lack of a heavy collar ring consisting of the apical-lateral and ventral arches is typical of the species, but these structures are present as thin ribs coincident with the constriction between the thorax and cephalis. Distribution. This species is very rare in the Gulf, being absent at most stations in the southern half of the Gulf. Its southernmost occurrence in the Gulf is at stations 92, 93, and 95 where its presence may reflect its response to upwelling along both coasts in this area. North of this region it is present at stations 106, 133, 136, 151, 184, 191, and 192. It is undoubtedly derived from the eastern tropical Pacific but its occurrence is so rare in these waters that it was not found in the southern Gulf stations sampled. Its greater frequency in the northern Gulf indicates its response to upwelling in this region. Jørgensen (1905, p. 136) states that this species is very rare in the Norwegian fjords. It was observed in one deep-water sample from the sea between the Faeroe and Shetland Islands. Its presence at these high latitudes in the north Atlantic as well as its presence in the tropica1 waters of the Gulf indicates its cosmopolitan nature.